In this series of articles I’m going to tell you how to SEO your website. There are 2 parts to SEO (onsite and offsite), this article discusses onsite SEO. The first thing we need to do is decide on which keywords to target for this its useful to do some keyword research. There are tools to do (such as good adwords tool) but another good way to do this is to look at what your competition is doing. 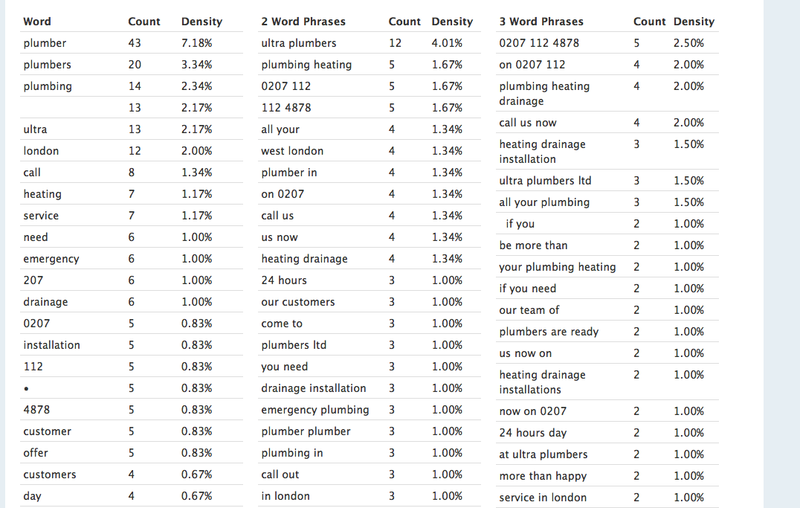 For example if your a plumber in London google plumber london and then use a website such as this to analyse the break down of keywords. Once you have a bunch of keywords you want to use. The next job is to put these into the page/s on the website and repeat them a number of times. We want to repeat the keywords but we also want them to look natural in the page when a human reader reads the page. Google and other search engines like content that humans like, that’s how they come up with such great search results when we search in them. There are 3 main places in a page we want our keywords to appear ( 4 if you include the URL ). If your a plumber you might have something like this: Plumber London – 24 hour callout plumber London – Plumbers of Bromley. Our web design team in Bromley develops websites that will represent your brand clearly. You need to work your keywords and phrases into the content of the page so they look natural and appeal to human readers, who came to your page. If they look good to someone searching for a web designer in this example , then they will also look good to Google ( other search engines are available). I hope I have given an overview of what you need todo in terms of onsite SEO. In the next article in this series I will discuss wordpress seo and in the last article in the series I will discuss offsite SEO to complete the equation.